We have been receiving a number of complaints where students have been refused educational loan as the residence of the borrower does not fall under the bank's service area. 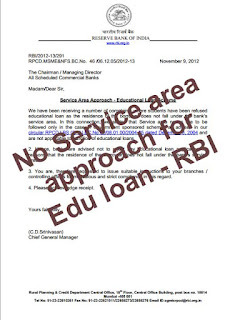 In this connection, we advise that Service area norms are to be followed only in the case of Government sponsored schemes as advised in our circular RPCD.LBS (SAA).BC.No.62/08.01.00/2004-05 dated December 8, 2004 and are not applicable to sanction of educational loans. 2. Hence, banks are advised not to reject any educational loan application for reasons that the residence of the borrower does not fall under the bank's service area.